Andrew Scheldorf, center, has added a number of new connections to his network of teachers. Once upon a time, a little boy growing up in rural Minnesota picked up a garden hoe and started weeding his mother’s vegetable garden. Little did he know, the plants he was digging up were actually the onions his mother had planted the week before. But that is how life works; mistakes are made, and you learn. This kid later grew to take over the vegetable garden, growing all kinds of wild plants, and convinced his parents to plant fruit trees and bushes all over, and deal with large numbers of seeds of plants he crossed. That, in a nutshell, is how I found my love of horticulture. I grew up in it without realizing it. 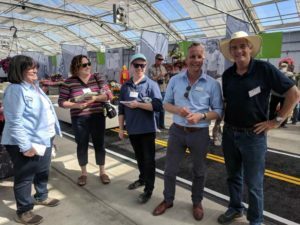 I worked in a greenhouse as one of my many high school jobs, and I learned a lot from my local greenhouse growers. Once I went to university for horticulture, my learning grew exponentially. I learned from professors, industry professionals, and other students. There was a part of me that thought I knew a lot more than I did. This experience at the California Spring Trials has shown me more than anything that I am only a little more than a kid digging in an onion patch. I might know now not to dig up the onions, but there is still a lot to learn, and there are a lot of people to learn from. This industry is quite unique to me. How many other industries get together and spend a week together sharing what they have done, talking and strengthening connections or making new ones? People have been incredible to me, not only willing to talk to me about their company or project, but also willing to stay in touch with me, offer help with projects, or teach me more about what they have done. I thought that I knew a lot, and maybe I do for someone my age, but it’s because I have been allowed great opportunities from my teachers inside and out of this industry. This event has put me in contact with so many new teachers and the people who have already started to clear the path that I would like to follow. If this industry is a giant garden, then I hope I will eventually be able to grow everything in it, but for now I will stick to growing my onions, learning the steps along the way to do the rest. Mistakes and missteps might happen, but with an industry like this to learn from, I am confident that I and other students will get there eventually. Andrew Scheldorf is the 2018 winner of the Dr. Allan Armitage Scholarship for California Spring Trials and a student at North Dakota State University. He will soon enter Cornell University to pursue a graduate degree in plant breeding. See all author stories here.